Yes, that Jay Leno. Early on in his career, the guy who backstabbed Conan O’Brien took himself seriously as an actor, or at we least assume he did. Maybe his thespian shots were some kind of elaborate Joaquin-Phoenix-is-a-rapper-like hoax. 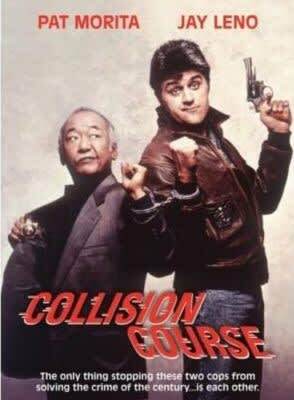 If so, then Pat Morita must’ve been in on the gag, too, or else he was just in need of a quick paycheck, because Mr. Miyagi actually signed on to bring down bad guys side-by-side with big-chinned Leno in the easy diss target of a folly Collision Course. It doesn’t take James Lipton to assess that Leno’s acting and “stunt-work,” a term we use lightly here, were funnier than any of his dialogue.